Is there a way to not have a reference to EntityFramework in the WebAPI? Are there any custom fuctions of AutoMapper to solve Mapping Problem? How can I empty a CosmosDB collection before adding new documents to it so that all metrics etc are kept? I want the same result but keeping all statistics etc. I've been learning about ASP.NET Core 2.2 recently and trying to develop a Role-Based login sample(Website + Web API) using JWT token. if user's role is "admin" then it redirects to admin page. if user's role is "user" then it redirects to user page. But most of the solutions and articles I found on "JWT token with ASP.NET Core 2.2" is only for Web API. Now my problem is how to consume above API using ASP.NET Core Website? This might be a simple problem for many a guys but I'm fairly new to web development and don't understand a lot of things. I'm writing a Unit Test case for a c# method with the help of Rhinomocks framework. Inside my actual method I access the Scheme property from the Uri property present under System.Net.Http.HttpRequestMessage namespace. The scheme property is accessed like _requestContext.RequestMessage.RequestUri.Scheme in the actual method. When I run my unit test case, it crashes inside my actual impletementation method when it tries to access/read the scheme property. In order to mock the URI and Scheme properties I tried like the below ways but it doesn't work as expected. What is the correct way to create a stub/mock for the Scheme property present under Uri. Note: I'm referring to the Uri property under System.Net.Http.HttpRequestMessage namespace. I am developing a desktop app in .net using wpf. This app will consume some web apis on my website using proper authentication using tokens. I am using httpclient for this communication and this is working as expected. I am now looking to secure the communication channel to avoid data interpretation by middleman, somewhat in the same way a browser encrypts using ssl certificate. Tried searching on Google and SO but couldn’t find something useful except using a web browser inside desktop app, which I do not want to do. Please help me find the right direction to proceed. 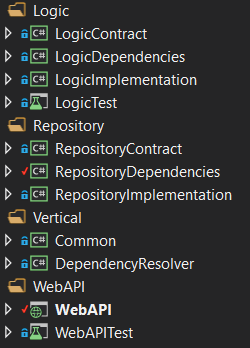 I have a layered arquitecture [ WebAPI -> Logic -> Repository ], so the WebAPI doesn't know about the repository layer. I'm using Unity for dependency injection so there are no direct references to other layers. The implementation of the Repository layer uses Entity Framework and EntityFramework assemblies are present in its "/bin/Release"
I have a project for each layer that handles registration of services with Unity, and EntityFramework assemblies are present in its "/bin/Release" too. To load a dependency I load the registration project with Assembly.LoadFrom, and therefore it also loads its dependencies. I tried copied the "configSections" and "entityFramework" to the WebAPI.config, even though I suspected it wouldn't work (it didn't). What I get here, is the context does some kind of deferred binding so it looks in the WebAPI references for the asseblies. _Is there a way to use the ones in the registration or implementation projects instead? I know installing EntityFramework in the WebAPI would work, but I don't want to do that. Is there another way? I am pretty confident in the configuration for SubscriptionApiModule. I have unit tests that provide evidence that a StandardKernel with a SubscriptionApiModule will respond to .Get requests with concrete classes I expect. An error occurred when trying to create a controller of type 'SubscriptionCheckController'. Make sure that the controller has a parameterless public constructor. Ninject.ActivationException HResult=0x80131500 Message=Error activating ModelValidatorProvider using binding from ModelValidatorProvider to NinjectDefaultModelValidatorProvider A cyclical dependency was detected between the constructors of two services. Suggestions: 1) Ensure that you have not declared a dependency for ModelValidatorProvider on any implementations of the service. 2) Consider combining the services into a single one to remove the cycle. 3) Use property injection instead of constructor injection, and implement IInitializable if you need initialization logic to be run after property values have been injected. Suggestions: 1) Ensure that you have defined a binding for DefaultModelValidatorProviders only once. Can you offer a way I can get NInject to be registered with WebApi controllers? I'm trying to map some entities to DTOs and some DTOs to entities by AutoMapper 8.0.0. This is my AutoMapper definition to map Entity to DTO. I was able to map Entities to DTOs by the definition below. But When I try to map DTOs to Entities by reversing Recipe and RecipeDTO, I was not be able to map. I got error. How Should I define automapper initialize to be able to realize this ? I have one or two methods, though, where I do not want it to do that, and really want the casing to be left alone. From an individual route's method is there a way to override that? I have hundreds of methods that want it, and just a couple that don't. I am having trouble making POST http request to web api using the Model containing byte as one of the parameters. Until I incorporated bson I couldn't even get anything in the controller. Now, I am making call that is receive by controller, method kicks in and the model seems to correspond and not being null, but its parameters values remain null. I am guessing this is because I am passing model with byte as one of the parameters, since I have successfully managed to POST modeled object that doesn't contain byte. Please have a look at my code, hopefully you will find my error. When I debug here get inside the controller's PostPictureLib and object is not null, however its' parameters are ALL NULL.